A team of four final-year LLB students has qualified for the regional finals of the EU Law Moot Court Competition, the second largest of its kind in the world. After passing the Written Proceedings Phase, Whitney Chizomam Opara, Sujeeva Erampamoorthy, Aaliyah Freemantle and Yael Massias will now travel to Helsinki to compete against 11 other teams from across Europe in the Oral Proceedings Phase. They are ultimately hoping to reach the grand final where they will plead before practicing judges of the Court of Justice of the European Union. Sujeeva, who was chosen from among her peers on the Advanced Mooting and Advocacy module to take part in the competition, hopes the experience will significantly enhance her employability. "The competition involves dealing with a scenario which is close to real-life. This helped us understand what our future careers as solicitors or barristers would involve," she says. "Through participating in the module, I have developed and enhanced my legal research skills and advocacy skills. I think it's an amazing opportunity that will definitely stand out on our CVs and it is something to talk about in job interviews." Aaliyah, who hopes to become a lawyer, feels she too has developed as an individual during the competition to date. "The best thing about taking part I think is all the knowledge I have amassed throughout this process – it has taught me a lot, and has helped me to grow as a student," she explains. "Also the chance to advocate in front of real judges is another great opportunity, which will prepare me fittingly for the career I wish to pursue." Senior Lecturer in Clinical Legal Education Lughaidh Kerin and Professor of European Law Laurent Pech (pictured above with the team), who are advising the students, were full of praise for their efforts to date. 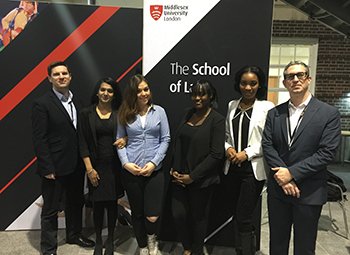 "We're pleased that a Middlesex team has done us proud by qualifying for the second stage of the EU Law Moot Court Competition and will defend our colours at the regional final in Helsinki," they said. "Congratulations to all of them." Find out more about mooting and our specialist moot chambers facility.